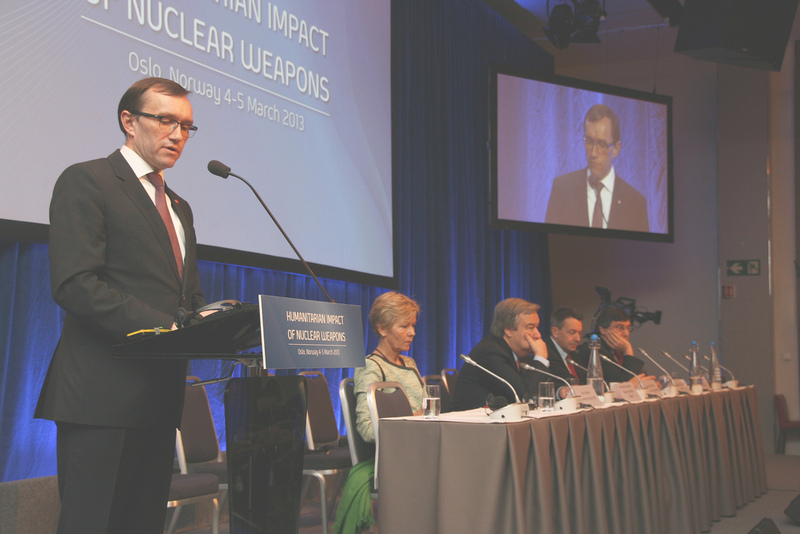 On 4-5 March 2013, Norway hosted the first-ever governmental conference on the humanitarian consequences of nuclear weapons. The conference saw widespread participation and engagement from 127 states, as well as international organisations, civil society participating under the banner of ICAN, and other experts. The positive engagement of states during the Oslo Conference on the Humanitarian Impact of Nuclear Weapons has strengthened efforts for a new beginning on nuclear disarmament and has successfully helped to reframe the issue of nuclear weapons from primarily an issue of national security and deterrence, to that of an unacceptable humanitarian threat. A key outcome of the conference was an announcement from Mexico that it intends to hold a follow-up conference, expected to take place at the end of this year or early 2014, seen by many as marking a pivotal move towards the start of discussions towards a treaty to ban nuclear weapons. The United Kingdom and the other permanent 5 members of the UN Security Council (P5), boycotted the meeting claiming that it was a ‘distraction’ from other disarmament processes. For those sitting in the conference room listening to the devastating humanitarian impacts of a nuclear weapon explosion and hearing testimonies of nuclear weapons victims, this seemed a particularly callous excuse. But the move can only be seen as a major strategic error. It has strengthened the resolve and sense of responsibility of those that do not possess nuclear weapons to pursue a ban treaty even if nuclear-armed states do not participate in the process. With very little progress being made in existing disarmament fora on nuclear weapons, the arguments given by the P5 for not participating are hard to believe. NATO states took a cautious approach, with none speaking on the first day. However Turkey set the tone for these states on the second day, welcoming the initiative as useful. Canada, Germany and the Netherlands were other NATO states intervening and while they noted the importance of working within existing mechanisms, their support for the conference was still significant. Amongst other states in extended nuclear deterrence relationships, Japan was visible and active in the meeting, welcoming the initiative, but casting doubt on the possibility of progress on disarmament. Australia did not speak. African and Latin American states were active and strongly supportive of the conference, although a variety of positions could be discerned in these regions. Progressive countries Austria, Ireland, New Zealand, South Africa and Switzerland gave particularly positive remarks during the closing session. These states emphasised the compatibility of working within and outside existing mechanisms, suggesting a new ban treaty would build on and reinforce implementation of existing structures. Tellingly, New Zealand stated that it would continue to work for disarmament in the Non-Proliferation Treaty (NPT) and Conference on Disarmament (CD) as well as in “any process that might follow on from this conference”. Article 36 has produced a report entitled ‘Banning Nuclear Weapons’, arguing that the humanitarian consequences of these weapons make a ban treaty an imperative, and that this can be done even if the nuclear-armed states will not participate in a process. In advance of the conference, Article 36 also produced a case study on the humanitarian impacts of a nuclear weapon detonation on the city of Manchester. The weekend prior to the conference, ICAN hosted a lively and informative Civil Society Forum, bringing together 400 activists from 70 countries to galvanize the campaign into action. An evening event with US actor and peace activist Martin Sheen and fellow activist Father John Dear was the extremely entertaining and motivating highlight of the weekend forum.